Real value for money has always been of paramount importance and in these particular hard times Laurel Bank's tariff for 2014/15 is little more than charged in 2008!!! Coupled with off season discounts, special offers and a winter refurbishment programme this is truly the way to beat the credit crunch without compromising on quality - Great rates for deluxe and family rooms. Laurel Bank B & B in Keswick is a charming Victorian guest house offering first class bed & breakfast accommodation in Keswick at the heart of the English Lake District. The proprietors of this idyllic guest house, Sue & Gary Lovatt are always on hand to make your stay as relaxed as possible, with a wealth of knowledge and advice on the area including information on walking, sightseeing, shopping and dining out and about. Conveniently situated close to Keswick town centre (twenty minutes walk via the disused Keswick Railway line) and the historic Castlerigg Stone Circle Laurel Bank B & B enjoys panoramic views of Grisedale Pike and the wooded slopes of Latrigg. Awarded 4 stars by the Visit Britain Authority for their bed and breakfast accommodation and service Laurel Bank B&B is proud of its reputation for offering first class B & B accommodation without the heavy price tag! 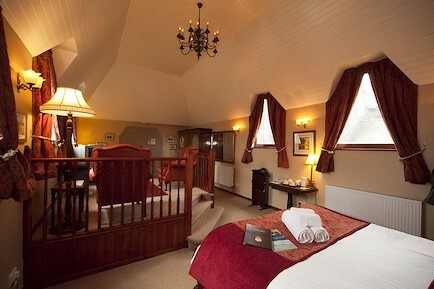 All guests rooms are en-suite and are comfortably furnished accommodating, singles, couples, triples and families. Breakfast is cooked to order and includes vegetarian options, smoked fish, fresh fruit. A hearty full English 'monty' is also available. There is a large private Car Park at the rear of the B & B with secure cycle storage and drying facilities should you have a wet day! It is non smoking throughout for your comfort and conveniently open all year round with discounts and special deals during the quieter months! Laurel Bank B & B in Keswick is the perfect location for a short break, special celebration, or that long awaited holiday. Sue & Gary look forward to welcoming you to their small but delightful guest house and promise to do their utmost to make your stay in Keswick one to remember with pleasure not pain! Your enquiry will be sent directly to Laurel Bank. Please fill in as much detail as you can.